As a hunter, you are an adventurer, a thrill seeker, and you're called to conservation. So let's buy a ticket. Where to? Anywhere wild game is plentiful and God's beauty abounds. 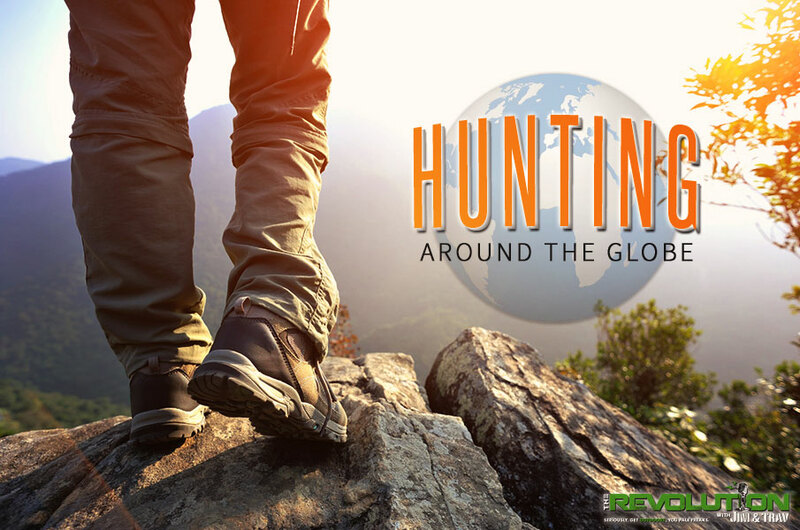 So, this week on The Revolution with Jim and Trav presented by Outdoor Channel, Sportsman Channel and World Fishing Network, we'll focus on 'Hunting Around The Globe' and international stewardship of our natural resources. The Revolution Lowdown: Responsibly educating the public on hunting practices on both domestic and foreign soils, how-to prepare for overseas hunts including transportation of a firearm internationally, why lion management is essential, the truth behind global wildlife poaching and trade and so much more. Ivan Carter from Carter’s W.A.R. that airs Mondays at 9:00 p.m. ET on Outdoor Channel joins the boys for a special two-part interview to talk about South Africa's growing conservation concerns and how hunting is the lifeblood for many of the Dark Continent's children. Ivan says that the increase in ivory and rhino horn prices is fueled by an insatiable demand from Asian countries, and if we want to end the senseless destruction and wildlife bloodshed, we first have to educate the consumer about the atrocities that come from it. Sustaining Ivan in this extreme battle of good versus evil, is his unwavering belief, and hope, that humanity is capable of change and compassion. Ivan will also address wildlife orphanages and the brutal reality that many baby wild animals are forced to face as a result of poaching and illegal wildlife trade. He explains that these orphaned animals are Africa's true lost souls, but, through all the devastation, they stand firmly as a bright shining star in Africa's future and a pertinent reminder of the consequences of our actions. Jeremy Mallette is the Social Media Manager for Silencer Shop and he's here to break the silence on suppressors. Jeremy touts the endless advantages of hunting suppressed says reduced recoil and sound suppression is just the tip of the iceberg. He'll dish the dirt on traveling internationally with a suppressor, why you should watch a few "Get Smart" episodes before you do, and that silencer ownership, with a little help from the pros' at Silencer Shop, has never been easier. Jeremy has taken everything from hogs to elk with his suppressed .300 Win Mag and he's chomping at the bit to board a plane for Scotland where he has a Red Stag hunt lined up for later this year. Check out Silencer Shop for all your silencer wants and needs and you'll be amazed by their endless selection. Brittany Boddington of The Boddington Experience and Petersen’s Hunting Adventures completes this week's broadcast with her own distinct take on the usefulness and influence that hunting has on wildlife and why she believes so many fail to see its value. Brittany has been fortunate enough to hunt all over the world and has taken everything from red stag with a crossbow, feral hog with an AR, chamois with a .300 Win Mag and eel with a spear. Brittany spent her beginning years as a non-hunter/shooter, and she likens her late start into the industry to lack of personal knowledge regarding wildlife concerns and the overwhelming absence of credible information regarding hunting/fishing and other wildlife practices on the web and other places. Brittany is always on the go and her adventures are never dull and we guarantee that you won't want to miss her interview.